Lately, Washingtonians have had their patience tested due to difficult times of deep political divides and unpredictable weather. Rent prices are soaring and the red line is probably single-tracking as you read this sentence. 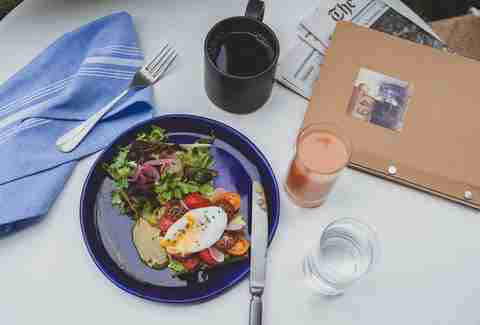 Instead of focusing on the negatives though, let’s turn our attention toward the one activity with the ability to bring joy to and to unify us all: brunch. Whether you’re seeking a comforting cure for your Sunday morning hangover, bottomless hours of fun, friends, and mimosas, or even upscale offerings to impress -- we’ve got you covered with a list of some of the best DC has to offer. Spending time inside the Line Hotel is an experience in and of itself and a well known spot in DC for Instagram photo opps. Breakfast and brunch selections include A Rake’s Progress upstairs, Spike Gjerde’s locally-focused restaurant with stunning cathedral views -- if you’re looking for the full brunch experience this is the spot. Try a hangtown fry or cheddar bacon burger with a spoon egg or scrapple, and wash it all down with a watermelon rose mimosa. 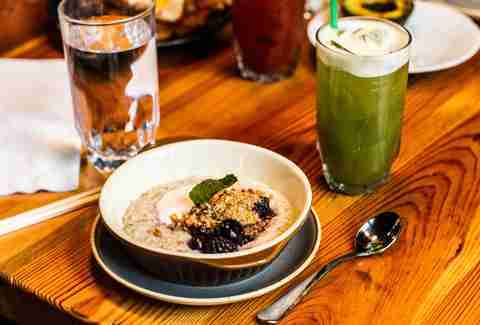 If a casual setting is more your vibe, you can try Brothers and Sisters downstairs for a bowl of savory oatmeal and a pepper chive biscuit. 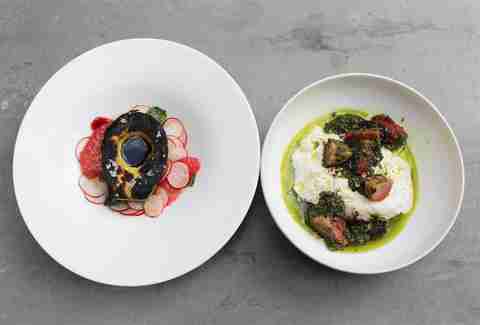 The latest from chef Tim Ma is American Son in the Eaton Hotel, where he’s serving up a vegetable-forward rendition of American comfort food, influenced by his upbringing as a second generation American. The restaurant is located in the stylish Eaton Hotel, with items such as a classic avocado toast with poached egg and a vegan “pork belly” hash. If you like seafood, head down to Whaley’s, which is dominating the seafood brunch game in the burgeoning Navy Yard. 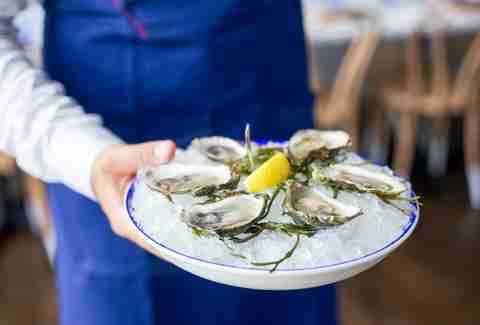 It features a raw bar with oysters, mussels, scallops alongside pancakes, and cocktails in a lofty space reminiscent of an old riverboat in Yards Park. If indulgent seafood towers and the waterfront scenery isn’t enough to tempt you, feel good that all of the used oyster shells go to Oyster Recovery Partnership, a nonprofit that helps improve the health of the Chesapeake Bay -- every half shell put back into the water can house 10 baby oysters, to keep the ecosystem (and restaurants) flush. 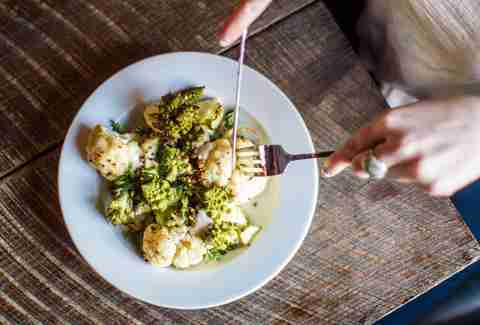 This swanky Logan Circle spot offers mouthwatering Italian and Greek small plates alongside seasonally rotating selection of brunch items such as sesame crusted feta, crispy yeast doughnuts, and many other twists on traditional brunch dishes. Adding to Iron Gate’s brunch experience is the ambiance -- definitely make sure to enjoy a well-crafted cocktail on the intimate patio and courtyard. 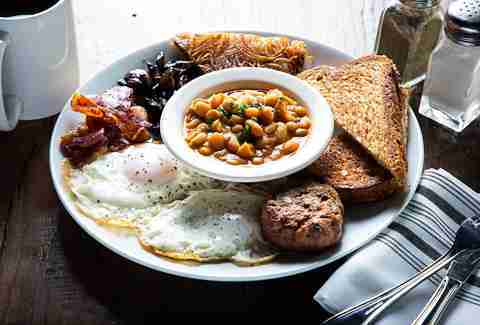 Open City is the motherland of brunch, open from early morning to midnight (or later) seven days a week. If that wasn’t enough, the patio is sunlit and charming, and the food is super-comforting with lots of vegan and vegetarian options. Go with crunchy hash browns, cheesy grits, or the popular California omelet, and enjoy the tasty espresso drinks in this little slice of heaven. We drool a little just thinking about DC Harvest, a locally sourced wonderland with a farmhouse feel on the H Street Corridor. This place is always bustling and yet the plaid-attired servers never make you feel rushed while serving robust platters of the healthiest, modern-American fare in town. The brioche baked french toast and grilled salt cafe steak with organic eggs will keep you satisfied all day, and you can wash it all down with $20 bottomless mimosas or a seasonal fruit or vegetable cocktail. Hemingway nerds, rejoice! This two-story gastropub’s artsy decor pays homage the the literary titan and serves a fitting mix of American and Spanish cuisine. The mostly European wine selection is terrific, and there are plenty of carbo-loading options from the dreamy pancake sandwiches to the buttery English muffins. 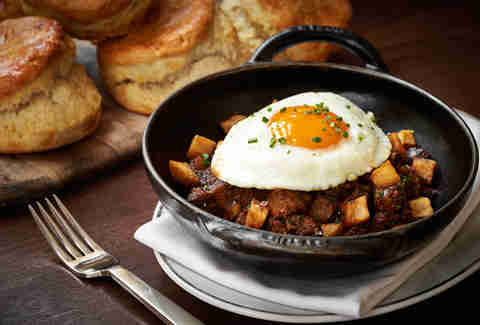 If you’ve had a long night you can even opt for the Hangover Cure, a seemingly endless bowl of biscuits buried under sausage, gravy, home fries, and cheesy eggs. If you’re looking for something more family-friendly, Brookland’s Finest Bar and Kitchen has a modern rustic feel and outdoor patio where everyone can enjoy traditional American fare and comfort food. Try the breakfast burger -- a hearty brunch-time favorite -- or the blueberry & ricotta waffle with bourbon maple syrup. Kafe Leopold is best appreciated if you studied abroad in Austria, or if you love excellent coffee, perfectly crafted chocolate, and sitting on a sunny plaza while a beautiful fountain gurgles nearby. Nestled away in a cobblestone alley in Georgetown, this peaceful retreat is a great place to enjoy a rich, frothy cafe melange and a honeyed waffle. If you don’t get something with chocolate in it here, like the praline mousse, you’re not doing it right. This cozy wine cubby is charming, to say the least, with gourmet grilled cheeses, flaky quiche, spiced tofu scramble, and their uber-popular pork belly hash. There’s also a huge list of wines to wash them down, as well as some specialty cocktails like the creamy horchata, or the Half Smoke with vodka, ginger beer, grapefruit, and house-made chili bitters. Although it’s one of the best whiskey bars in town by night, by brunch it’s all about the fruit and sparkling wine. The old-world feel of antiqued wood and marble, glowing under saffron lamps and taxidermied buffalo heads makes this a hipster haven. Its vintage interior opens to an adorable outdoor brick patio that’s the perfect place to enjoy fresh and fluffy beignets balanced by a tangy grapefruit mimosa. The fried green tomato Benedict with pimento cheese mousse is a dream come true. Among brunch enthusiasts in DC, one of the most commons refrain is, “Le Dip!” This bustling brasserie serves classic French fare and delicious drinks amid a zinc bar, decorative tile floors, and airy sidewalk cafe. The vanilla French toast gets rave reviews, but you can’t go wrong with the rest of the massive menu -- which includes crispy frites, juicy duck sarladaise, croque-madame, and steak tartare with a quail egg. 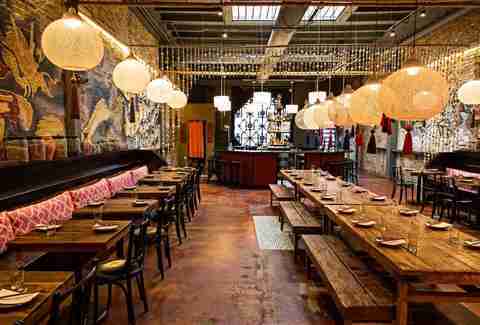 Daikaya is split into two spaces: the modern downstairs space focuses on Sapporo-style ramen, while the upstairs whiskey bar serves small plates of Japanese-influenced comfort food like Mcdoriyaki -- Japanese pancake with Salvadorian chorizo, egg, maple syrup. And who could honestly say no to the French Toast, which is soaked the night before in cream and soy milk, then dusted with Kinako powder? 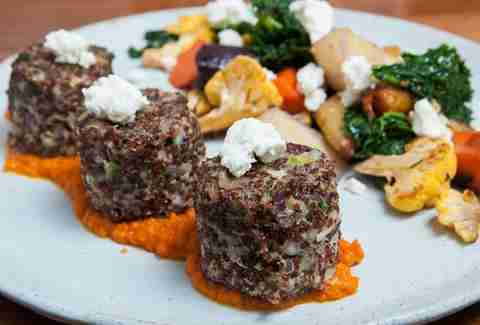 Mintwood is Franco-American comfort food done just right, in a modern farmhouse-style location complete with wood-burning oven and quaint sidewalk seating. A unique ambience and enticing selections like Basque-style pork hash and smoked salmon eggs Benedict make this spot a must-visit. Then there’s its take on a hangover special that piles hamburger and onions in with Cheddar, bacon, and a sunny-side-up egg. Union Market has everything. Navigating the bustling neighborhood hub, you’ll likely run into a few people you know, and hopefully you’ll be blessed with good weather so you can eat at one of the picnic tables outside. 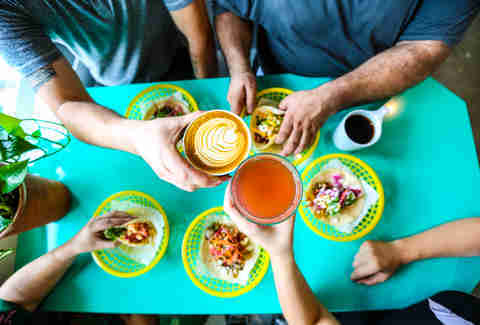 The hardest part is choosing where to go and what to order: Options include tofu tacos at Takorean, a refreshing acai bowl from South Block Juice Co., a strawberry liege waffle at Saison Wafel Bar, bread pudding at Puddin', or the lambs and clams at Rappahannock Oyster Bar. Make a day out if it, if your stomach can handle it. 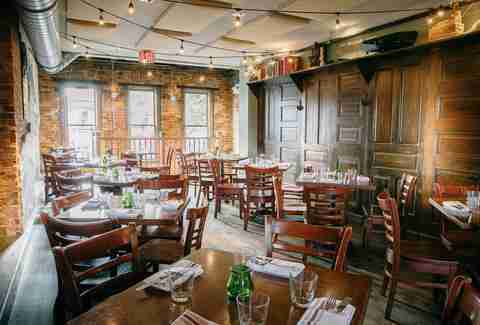 Homestead is as its namesake suggests -- a welcoming rustic-style row house of exposed brick and reclaimed wood with multiple floors and bars, and a lively roof deck. 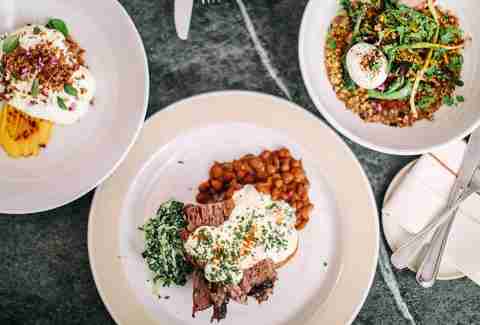 The family-style Southern pub fare includes meatloaf with Louisiana-style shrimp and grits, but at brunch, you’ll find a variety of egg dishes with lamb bacon, Homestead Benedict with sliced porchetta, and an egg-topped burger with pickled onions and garlic aioli. Named for the mile markers that once shaped the city, this warm and friendly neighborhood pub at the heart of Bloomingdale prides itself on being a restful refuge for those who enjoy simple pleasures like $14 bottomless mimosas and bloody marys. Bordering on the edge of being divey, Boundary Stone is an Irish-leaning local watering hole with a tin ceiling, oak bar, and plenty of nooks and crannies for comfortable conversation. Chill in the outdoor seating and dig into the French Texas toast, huevos rancheros, or maple syrup bacon grits. There’s a reason this place is a Michelin Star restaurant. Its locally sourced delicacies merge rustic and contemporary flavors of American cuisine in a casual chic tavern atmosphere, with an outdoor terrace that’s an urban oasis. 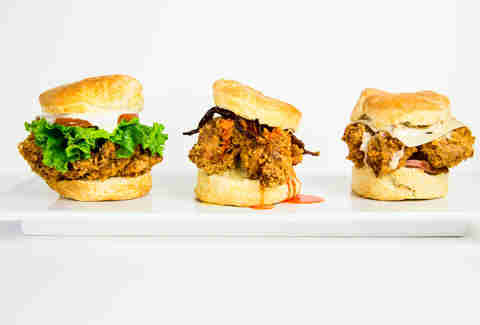 The silky short-rib hash is a must-have, but you can’t go wrong with the hot-fried chicken biscuit, or the raclette burger. And why not accompany any of those with a sorbet mimosa? A charming neighborhood café that doubles as a market, Little Red Fox features a lovely outdoor patio and communal inside seating. Somehow this small space has managed to establish itself as a successful one-stop shop with everything from fresh produce to wine and beer on sale, to its homemade baked goods and tasty take-to-go side dishes and mac n cheese. 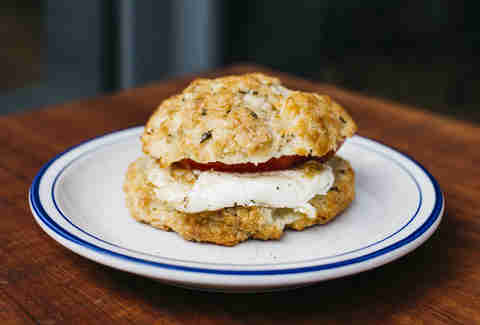 Besides their baked goods, the breakfast/brunch selections include items such as the “Portlander” with a fried egg and house-made apple butter, and the crowd favorite Foxocado with a fried egg, house-made salsa roja, and avocado spread on ciabatta. Tucked away in the now-booming and increasingly stylish Blagden Alley, Tiger Fork promises to “meld old school Hong Kong culinary tradition with pops of global influence.” Their brunch menu is fun, unique, and meant to be shared -- featuring dim sum style plates, congee, and a Hong Kong French Toast with peanut butter and sweetened condensed milk. 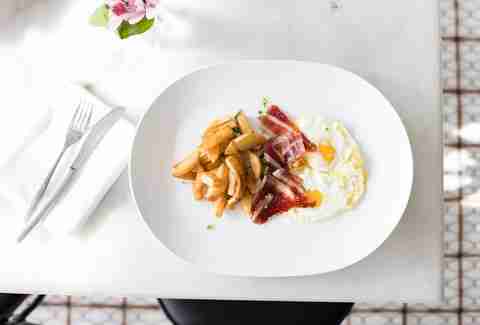 Get that “coming home” feeling at family-owned Joselito, whose Spanish fare is both authentic and inventive. 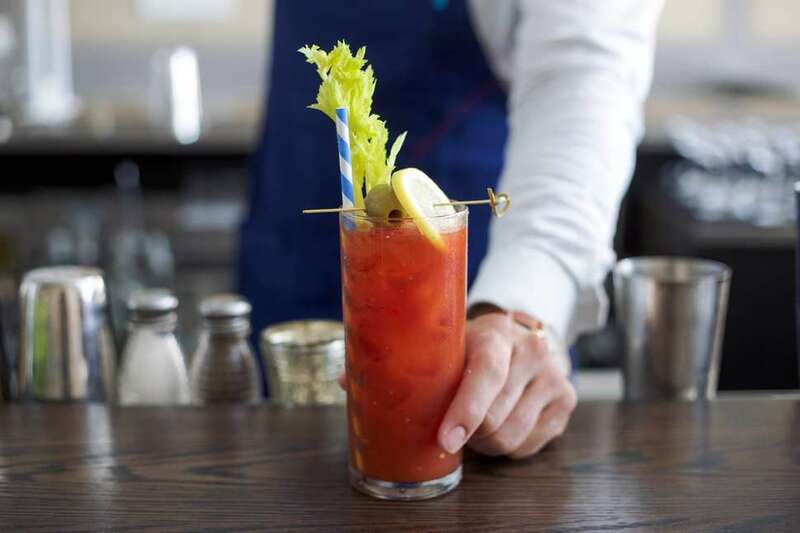 Order dishes like smoked salt cured cod with gazpacho or the jumbo lump crab Benedict off their bottomless brunch menu, and wash it all down with brunch libations like mimosas or homemade sangria for either six dollars each or 20 dollars for unlimited. Austa Somvichian-Clausen lives in New York City as the Instagram Manager for Apartment Therapy Media. By night she is a freelance food writer with a particular proclivity for restaurants that source locally, and a lover of any good happy hour. Over the weekend she loves hiking, exploring the city, and traveling. Follow her on Instagram. Kelly Carnes is a freelancer for Thrillist, a recovering publicist, and lives her life by the ancient philosophical saying: yoga fixes everything, unless of course it doesn't and in that case try puppy snuggles. Follow @kellycarnes on Twitter and Insta.